Richard “Rich” Miano is a great story. Originally a walk on at Hawaii, Miano would end up becoming an All WAC defensive back for the Rainbow Warriors. Upon graduation in 1985 the New York Jets would draft Miano in the 6th round. He’d end up starting one game a piece in his rookie season and his sophomore seasons winding up with 2 interceptions and 60 tackles providing valuable depth to the Jets secondary. Over 1987 and 88, Miano would be entrusted with the starting assignment at strong safety, making 5 interceptions and 112 tackles, before being sidelined for nearly 2 seasons with a catastrophic injury in 1989. Losing his 1990 as well, Miano was exposed Plan B by the Jets at season’s end, thinking they could either sneak him through free agency or that he was done, but the Eagles opportunistically snapped him up. He’d work his way slowly into the lineup over 1991 making 3 interceptions, starting 1 game. By 1992 Rich would become the defacto starter at strong safety for the Eagles, starting 11 games and making a career high 125 tackles. Granted the starting assignment again in 1993 Rich would start 14 more games and intercept a career high 4 passes at free safety, while making 104 tackles. As injuries piled up after the season, Miano would not see any signifigant starting time in the next two seasons finishing his 1995 as a member of the Atlanta Falcons. After retirement, Miano would return to his Alma Mater of Hawaii where he is an assistant coach for the Warriors. 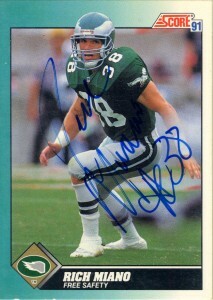 I got Rich’s autograph at Philadelphia Eagles training camp that summer in West Chester. I remember the team had to run gassers because head coach Richie Kotite did not approve of the amount of fighting that was going on between teammates that day but I still managed to get a few autographs. I felt like the Score Supplemental 1991 set was bloated, especially after the great success of Score Supplemental 1990. There were not as many impact rookies as there were the previous season, and seeding the lot with not exactly household names – like Rich, didn’t help either. As mentioned on a previous post, Score just got uglier and uglier for a while there during the 1990s.